Hmm... I was going to comment on the Reactive Dogs FB group, but I guess you weren't allowed to keep the post up?? I'm in Toronto and this morning it was -22 degrees Celsius (-7 F) with the wind chill. It definitely is a struggle in winter, but I'm glad my dog gets me out of the house (otherwise I'd probably gain 10kgs!). It's also fun to watch her prance around in the snow. I love that there are so fewer people and dogs out in winter. Makes it much more manageable in some ways. Thanks for visiting! Yes, I did not realize you couldn't post links there. We've had a few days below zero here as well, although this week it has warmed up considerably. 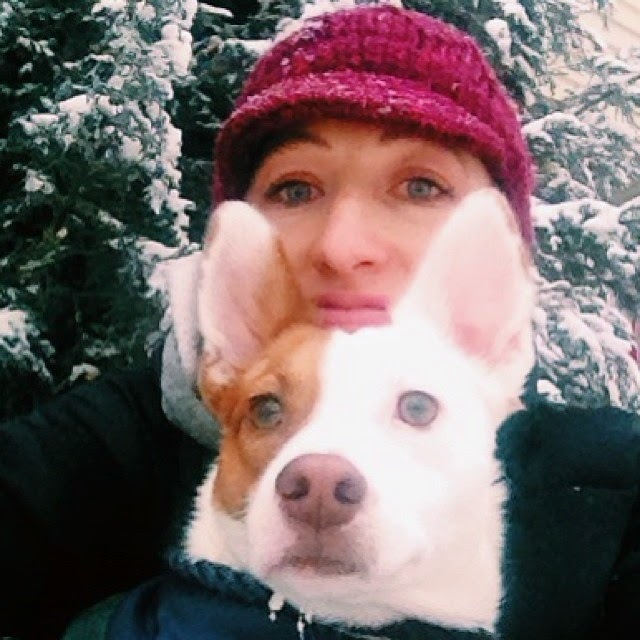 I'm glad you and your dog have found ways to enjoy the winter, too! I really love the silence when it snows, and I also love not going to work on snow days. This is the only time where I'm by myself with Bain off leash is in a snowstorm, we have a large field here. No one is out there and he gets to run around safely for once. Ah, snow days! I remember once when we got a huge blizzard (several feet) with my previous dogs, letting them run loose since they couldn't go far in the deep snow and there was literally NO ONE around. I also hate the winter, the dark, and the clouds. But I'm so glad Honey drags me out every day. I'd also join the pajama brigade. And then I'd feel awful. I'm astounded at how many people in upstate NY simply stop walking their dogs in the winter. We won't see some of our neighbors until spring. That's a real benefit for reactive dogs and their people. There are so few folks and their pups to be concerned with. I'm also in the firmly hate winter club. Which is hilarious since we just moved from California to Oregon. :D Zoe is also in that club. Phoenix doesn't like cold wet weather but she's okay if it's just cold but sunny. I do enjoy having less people to deal with, though!! I love winter. I had never really thought about how snow dampens noise, but it does. My Shyla is "reactive" but in a different way. She cowers and tries to hide when we meet certain dogs and people. I have noticed how nice it is that there are so many fewer people out and about in winter. That's something to love! Ah, skateboards. We haven't even come close to trying to face that one recently when we're in town. When it happens by accident, Shyla has a meltdown... but it hasn't happened in a long time (hypervigilant me). I'm with you, I'm not, absolutely not, a fan of winter. However, I do agree with you for all the reasons you mentioned, snow can be great for walking... as long as I'm bundled up enough! Another sub-zero joy: watching the "dragons" run and run, then puff great gouts of white steam when they come to a stop.